This beautiful kitchen scale with a removable and dishwasher-safe bowl weighs ingredients up to 3 kg (accuracy 10g). SCALE becomes a nostalgic eye-catcher in your kitchen and requires neither power nor battery. A must-have for all hobby bakers, cupcake lovers and for everybody with a sweet tooth! 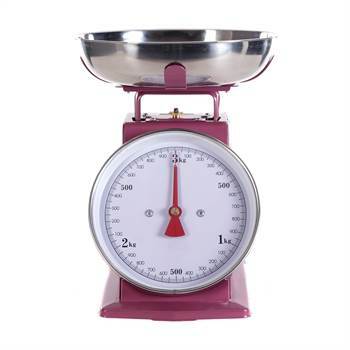 Our chic kitchen scales are easy to use and also look fantastic. You can find this scale in many different colours in our shop. Just have a look and pick your favourite colour. Measurements (app. ): Height (without bowl): 8", Width: 6.3", Depth: 8.5"
Nostalgic kitchen scale, available in many different colours.